R.A. Salvatore muses on the identity—and unintentional identity crisis—of one of Drizzt Do’Urden’s most important allies, the fearsome black panther Guenhwyvar. She started out as a dog, a moorhound, actually, named Canthus. When I wrote a sample chapter to audition for the second book ever published in the Forgotten Realms setting, way back in the summer of 1987, I thought the Realms were the tiny Moonshae Isles and that TSR (the original publisher of the Forgotten Realms setting) was looking for someone to write a direct follow-up to Doug Niles’s Darkwalker on Moonshae. I didn’t want to use Doug’s characters in any meaningful way—they’re wonderful characters, but I don’t like sharing protagonists!—so I grabbed one, a sly fellow named Daryth and his moorhound named Canthus, to introduce the hero of my story, Wulfgar of Icewind Dale. Quite a bit changed during that audition period, starting with me discovering the size of the Forgotten Realms, and learning, to my great relief, that my editor didn’t want me anywhere near Doug’s work, since he was writing sequels to his book. So I set my book, The Crystal Shard, far away in Icewind Dale and added a character named Drizzt Do’Urden who soon took over the book. One thing I did keep from Doug’s example, however: the animal sidekick. Why? Any pet lover already knows the answer to that question. Drizzt was created as the classic, misunderstood outcast, a bit of a loner, and often driven by circumstance to his own devices. Has anyone gone through junior high school or high school who can’t relate to this? I certainly can. And in those times when I found myself confused and feeling very alone, I had a savior, a dog named Cocoa and then a dog named Yuma. They listened, without judgment, and using them as sounding boards often got me through the tough and lonely days. So Drizzt needed a friend like that, I figured, and Guenhwyvar was born. The cat remained a “she” in my mind, certainly, but I painstakingly went through the manuscript of The Crystal Shard and removed all of the gender-specific pronouns. In some places, the use of “it” sounded quite awkward ; when you name a character, then use “it,” well, try to do it and you’ll see what I mean. Nevertheless, I had my orders. Soon after The Crystal Shard hit the shelves, I discovered, to my chagrin, that the copyeditor had apparently spotted the awkwardness of the gender-neutral pronoun, too, and so he/she (it?) had smoothed out the prose... by replacing “it” with “he” and “him”! But no, Guenhwyvar is a female panther! I got the name from those magnificent Mary Stewart books about King Arthur, where “Guenhwyvar” is the spelling of Arthur’s Queen, and, according to Stewart, the name meant “Shadow.” Perfect for Drizzt, I figured, coming from the shadows and needing a shadow. 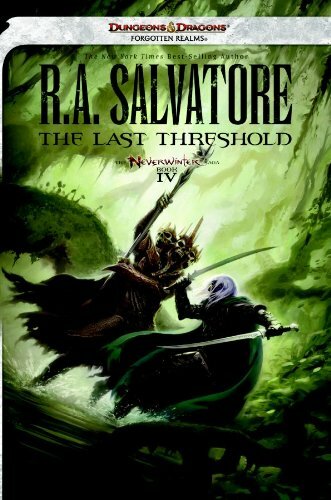 Wherever would Drizzt have been without her? Indeed, where will he be without her going forward? Read The Last Threshold to know more.